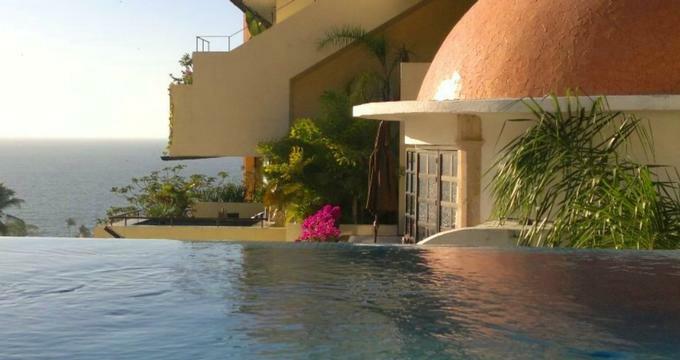 Nestled in the hills above Puerto Vallarta overlooking Banderas Bay, Casa Cupula is a luxurious boutique hotel set in the heart of the Zona Romantica. The gay-friendly, adults-only guesthouse combines elegant sophistication with modern day functionality to provide a unique retreat for guests with deluxe accommodations, upscale amenities and facilities, and breathtaking ocean views. Serving Vallarta’s LGBT community for the past 15 years, Casa Cupula boasts an inviting ambiance with friendly staff, two swimming pools, a hot tub, and a large sun terrace with loungers and umbrellas. The hotel’s onsite Taste restaurant serves a creative menu of Mexican-style dishes and American fare, along with handcrafted cocktails, imported spirits, artisan beers and fine wines from around the world against a backdrop of ocean views. Casa Cupula is an easy walk from Playa de Los Muertos Beach and the seafront, while the Puerto Vallarta Cathedral, the Zoo, and Botanical Gardens are a short drive away. Casa Cupula features ten exquisitely appointed and beautifully decorated guest suites with unique interior décor and contemporary furnishings, contemporary lighting, and original artworks. Individually styled guest suites have king or queen-size pillow-top beds dressed in high-quality, designer linens, comforters and pillows, and en-suite bathrooms with walk-in rain showers, Jacuzzi spa bathtubs, Turkish towels, signature bathrobes and slippers and designer Damana toiletries. Living areas have comfortable sofas and armchairs, work desks and chairs, and a with all the appliances needed for hassle-free holiday living. Modern amenities include Apple TV with free Netflix, LED televisions with cable channels, home theater systems with BlueRay players, Dolce Gusto capsule coffee machines, hairdryers, and complimentary wireless Internet. The Frida Suite celebrates the life and art of Mexican artist icon Frida Kahlo and offers 860 square feet of space with beautiful views of the lush tropical gardens surrounding the hotel. The suite features a spacious living area with a fully equipped kitchenette with washing machine and tumbles dryer, huge glass windows framing stunning views, and a private terrace with a table and chairs and a spa tub. The bedroom has a king-size bed dressed in high-quality, designer linens, comforters and pillows, and an en-suite bathroom with walk-in rain shower, Jacuzzi spa bathtub, Turkish towels, signature bathrobes and slippers and designer Damana toiletries. Other luxury suites include the two-story Penthouse Suite, the sophisticated one-bedroom Sayuri Suite, the classic Milagro Suite, the tropical Greenbelt Terrace, the dramatic Cupola Suite, the Grand Vista King Suite, the modern Deluxe King Suite, the cozy Villa Queen Suite, and the beautiful new Oaxaca Suite. Casa Cupula’s Taste Restaurant serves a creative menu of Mexican-style dishes and American fare in a lush tropical setting, accompanied by a diverse wine list of excellent Mexican wines, hand-crafted signature cocktails, and artisan beers from the full service bar. A complimentary breakfast is served every morning and includes freshly baked bread and pastries, seasonal fruit, cereals and yogurt, a variety of signature dishes, and freshly brewed coffee, tea, and juices. Casa Cupula offers an array of facilities and guest services, including two swimming pools, a hot tub, and a large sun terrace with loungers and umbrellas, as well as an onsite restaurant and full service bar with breathtaking ocean views. Exclusive excursion and tour packages are offered around the island, such as jungle zip-lining adventures, horseback riding trips, luxury sailing charters, and walking tours through the Old Town of Puerto Vallarta. Additional guest services include luxury transportation and shuttle services, pampering spa and massage services in the privacy of guest rooms or poolside, tequila tasting workshops, romantic dinners under the stars, and exclusive Chef’s Table evenings of excellent cuisine and wines. Casa Cupula provides a beautiful venue for special celebrations such as weddings and honeymoons with a variety of honeymoon and wedding packages for couples. Packages range from Tropical Honeymoon Packages, Cupula Honeymoon Escape Packages, and Deluxe Wedding Packages, to luxurious Caprice and Cupola Wedding Packages. Puerto Vallarta is a beautiful city on the shores of Cuale River and offers a variety of attractions and activities to enjoy from historic sites to outdoor activities. The city’s picturesque streets boast beautiful architecture, and quaint shops, cafés and bars, and pristine beaches such as Las Animas, Majahuitas, Qumixto, Yelapa, and the Marietta Islands are nearby. All-terrain excursions include hiking, mountain biking, snorkeling, scuba diving, bird and dolphin watching, parachuting, seasonal whale watching, sailing, and yoga, as well as visiting the Crocodilarium and the El Salado Estuary, the Cuale Cultural Center Auditorium, and the Boutique Theatre for performances and shows.